The keys to getting this right are preparation and allowing yourself enough time for the several stages of baking and setting. 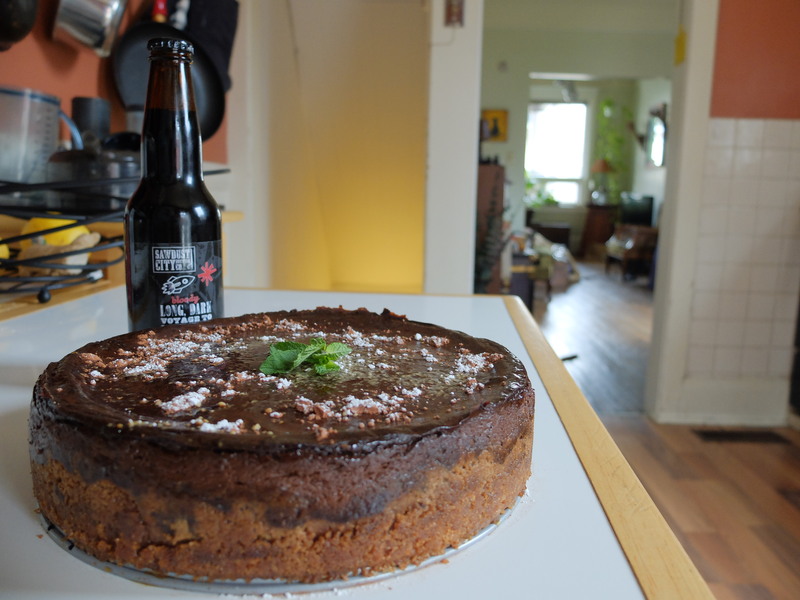 I would strongly suggest measuring out as many of the ingredients as possible in advance (especially if you’re new to baking, like me) because once things start happening, there’s quite a bit to stay on top of. Don’t add unnecessary stress by trying to find the vanilla extract while your sugar is burning. Preheat oven to 350°F with racks in middle and lower third and put a baking sheet on lower rack. Flip bottom of springform pan so lip is facing down, then lock in place. Grease bottom and side of pan. Stir together all crust ingredients, then press onto bottom and 1 inch up side of pan. Bake until set, 10 to 12 minutes, then cool completely, about 45 minutes. 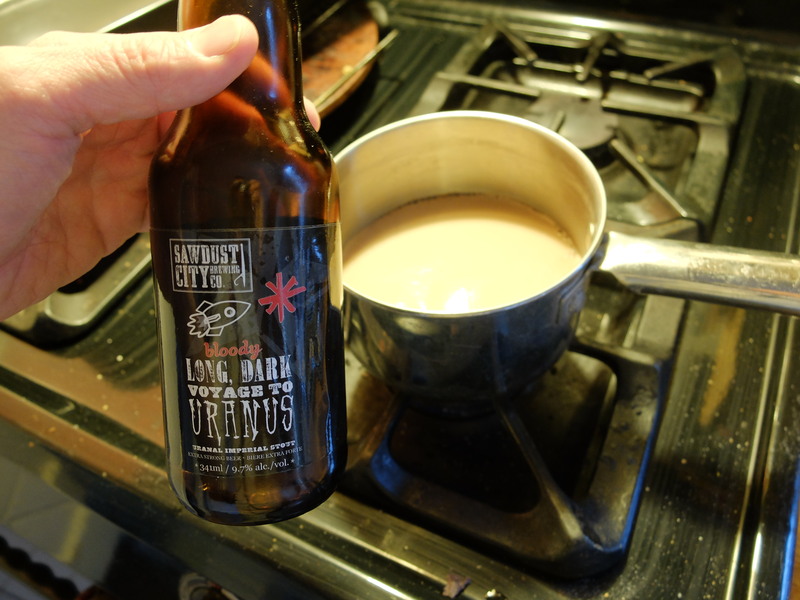 In a small pot, simmer beer over medium heat until it is about 1/2 its original quantity. Heat 1 cup sugar in a 1 1/2-to 2-quart heavy saucepan over medium heat, stirring with a fork to heat sugar evenly, until it starts to melt, then stop stirring and cook, swirling pan occasionally so sugar melts evenly, until it is dark amber. Remove from heat and carefully stir in water (mixture will bubble up and steam and caramel will harden), then cook over medium-low heat, stirring, until caramel has dissolved. 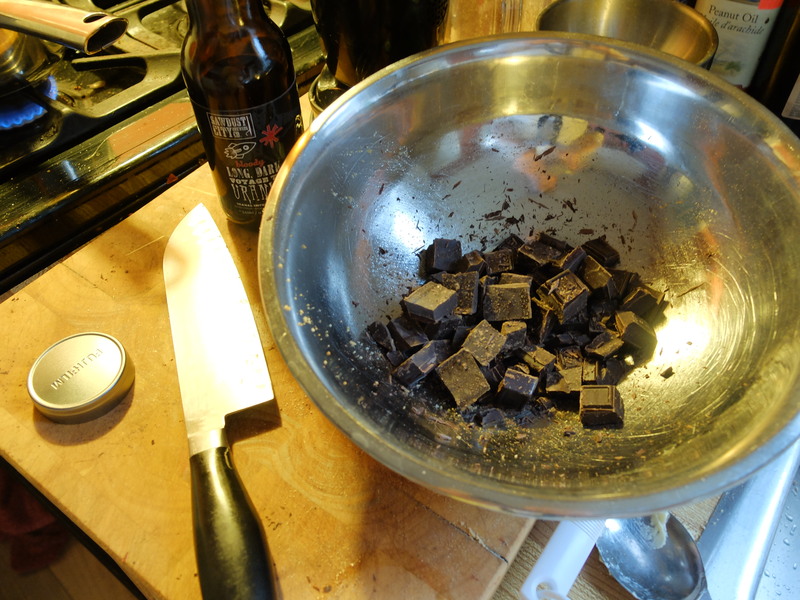 Remove from heat and whisk in the beer and chopped chocolate until smooth. Cool fudge sauce slightly. Purée tofu and cocoa in a food processor until smooth. Beat soy cream cheese and remaining 1 1/4 cups sugar with an electric mixer at medium-high speed until fluffy. At low speed, beat in tofu purée, vanilla, salt, and fudge sauce until incorporated. Pour filling into crust and bake on middle rack until top of cake is shiny but center is still slightly wobbly when pan is gently shaken, about 1 hour. Turn oven off and leave cake in oven 1 hour more. 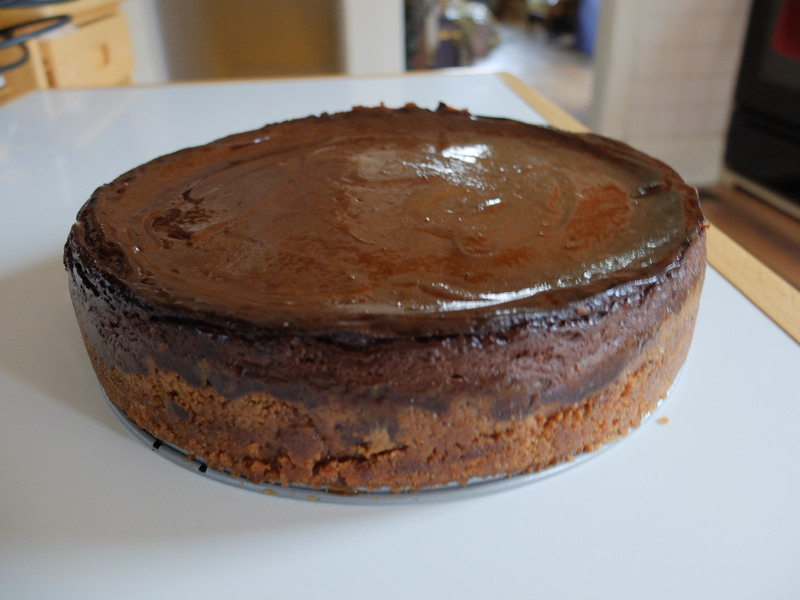 Run a knife around top edge of cake to loosen, then cool completely in pan on rack (cake will continue to set as it cools). 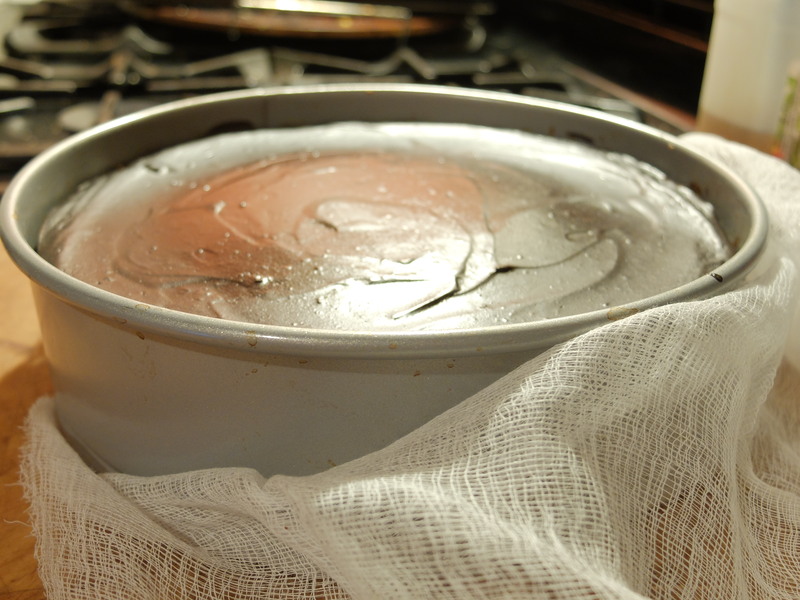 Chill cake, loosely covered, at least 6 hours. Remove side of pan and transfer cake to a plate. Bring to room temperature before serving if desired. 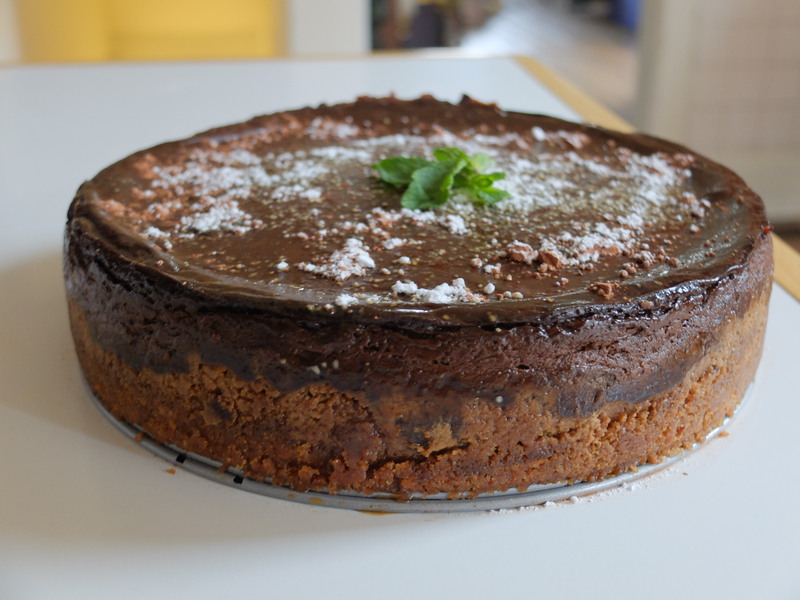 Vegan cheesecake, ready to eat!